Sign up for the Pledge to End Racism Workshop. 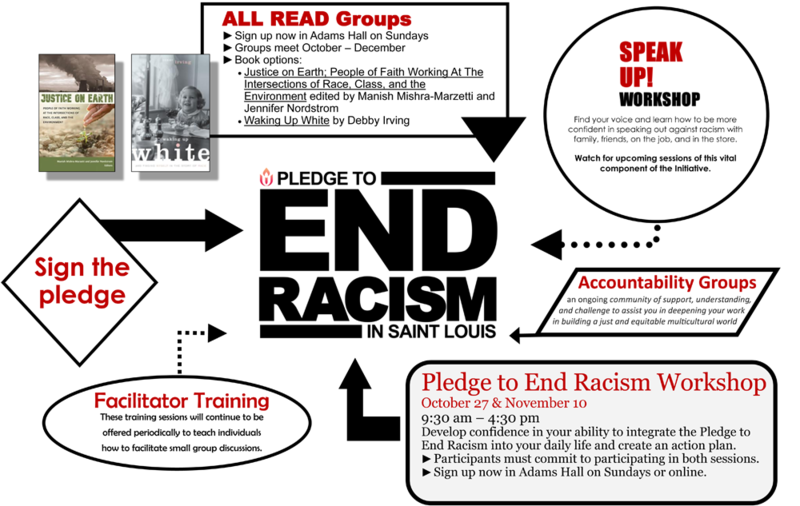 Are you ready to Pledge to End Racism in St. Louis? Please do not sign a Pledge Commitment Card if you have questions about whether you can make this daily commitment to honor The Pledge, or if you are not ready to accept that we each have work to do on the racism and prejudice in our own hearts and on the systemic racial inequalities throughout our region. We are each at a different place in our journey, so we ask that you sign it when you can sign it with full integrity. When you ARE ready to make this commitment, please pick up a Commitment Card from the rack next to the Pledge banner hanging in Adams Hall, from the SJA table any Sunday, or from the church office. Leave your signed copy of the card in the Pledge to End Racism box. Then take another copy of the Commitment Card and Pledge statement itself to post on your refrigerator, or on a mirror for you to reflect upon daily.